Here an eye, there an eye…. I have been casting my eyes over Veronica Cereceda’s beautiful book on the weaving of the people of Tinkipaya, Bolivia marveling at the complexity of the patterns and the use of certain combinations of color to create light and shadow. According to Cereceda, the colors most used, and this is immediately evident from the many stunning photos in the book, are white, yellow, orange, black, light green, dark green, bright blue, bright pink, dark red and purple. I have yet to find any reference to the type of yarn used and whether it is bought in these colors or dyed by the weavers themselves, but as I said, I have only had the time to simply leaf through the book at this point. I have to say that it is refreshing to find these bright, obviously synthetic colors in use in these gorgeous textiles. The bright pinks, lime greens and strong yellows so often favored by the women of the highlands can quite often be jarring to our “Western” eyes. When one sees the dry, bleak landscape of the high plains, it is easy to appreciate the desire to create brightly colored cloth. 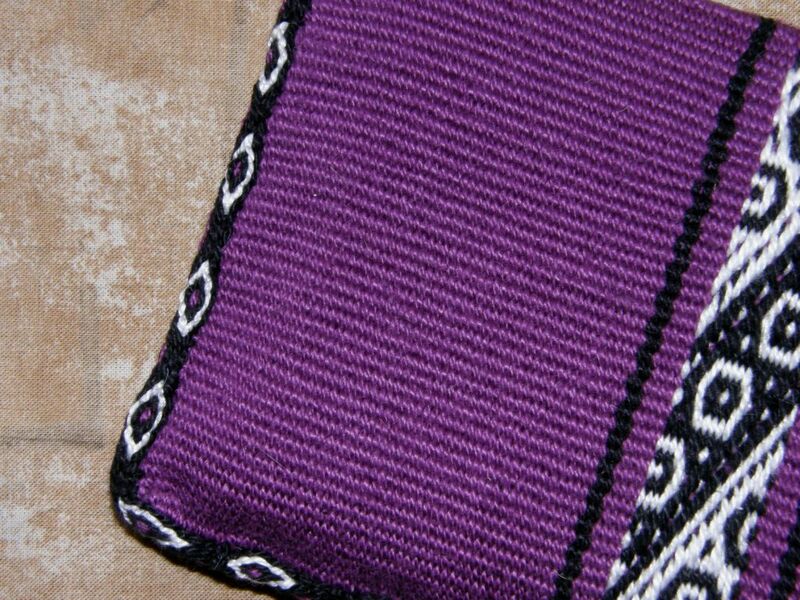 However, I think that it is the certain placement of these colors on the cloth of Tinkipaya to create the bands of light and shade that make these textiles so attractive. The piece above from Tinkpaya was most likely made for sale to tourists and may have been adapted slightly color-wise for this purpose. I don’t see anything with that particular shade of blue among the many pictures in Cereceda’s book and the colors generally are a little bit toned down compared to the pieces I see on the pages. I can actually get a little tired of muted natural dye colors in the same way that I get tired of wandering from booth to booth of hand painted skeins at fiber festivals. I have always said that I am not a “yarny’ person. Don’t get me wrong, I do love the natural dye colors, but it is very nice now and then, just for a change, to see the brighter and more “acid’ colors used so nicely. When I learned to weave in Potosi, the same province of Bolivia in which Tinkpaya is located, I had my teacher choose the colors for my second learning piece as I wanted to weave something that was to her taste. My teachers were not from Tinkipaya and the placement of the colors in the pieces I wove with them has nothing to do with the style of textile from Tinkipaya. Yet it is interesting to see the kinds of colors, pictured above, that they favor when we in the west are so drawn to the softer earthy tones achieved when using natural dyes. 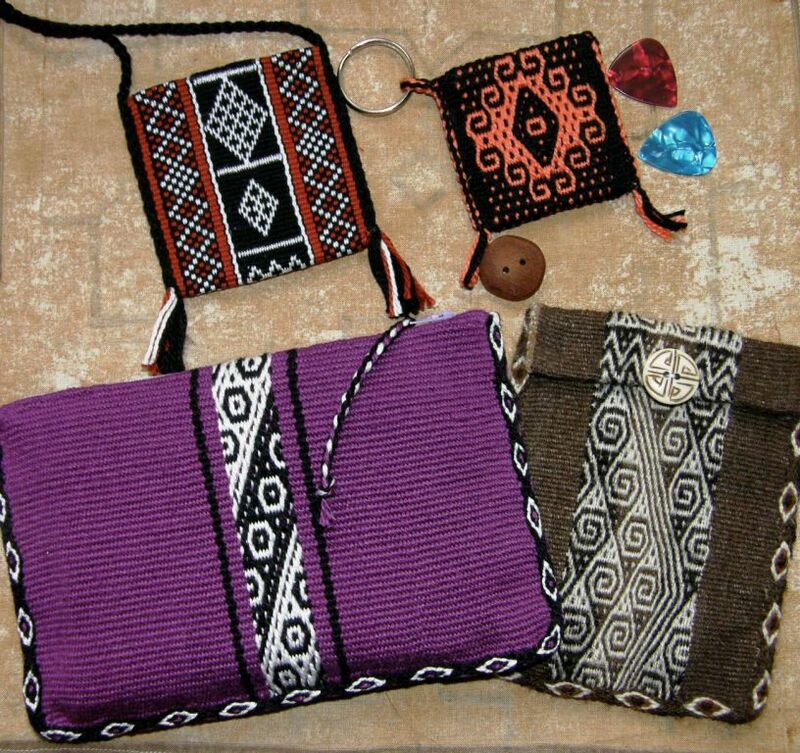 The design that I wove with my teachers on the ch’uspa, the smaller of the two bags pictured above, is woven in Tinkipaya where it is known as ch’uritos, spirals. I have been told by other weavers that the pattern represents the swirling waters of a fast running river. It is normal in my experience to hear different interpretations of the same designs from different weavers. 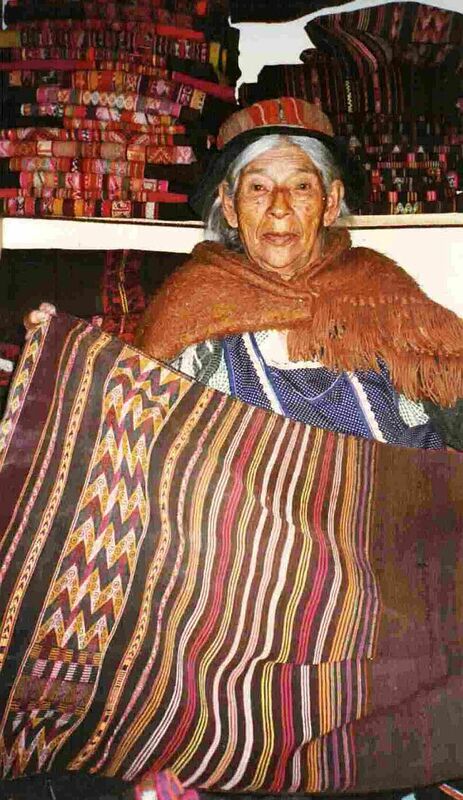 The small “circles” on the Tinkipaya textile are very typical and are called ñawis, eyes, according to Cereceda. 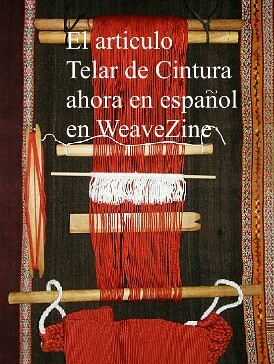 Weavers that I have met have generally told me the name in Spanish…ojitos. 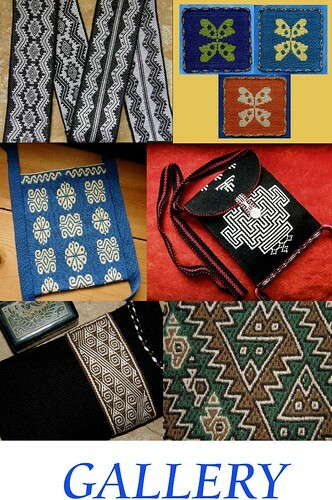 The zig zags on which the ñawis sit, known as kutinaku, are also very typical and are one of the principal identifying elements of textiles of Macha and Tinkipaya. Here is Dona Maxima in her tiny store in Sucre in 1997 showing my friend Ulla and I a weaving from Macha with its kutinaku and ñawis. I wanted to try weaving just a small slice of the eye design from one of the Tinkipaya textiles so that was one of my projects this week. There it is on the purple pouch which has a nice lilac zip from the bag of assorted zips that were given to me by Sharon and Betty. I am always bound to find just the right color in that bag. 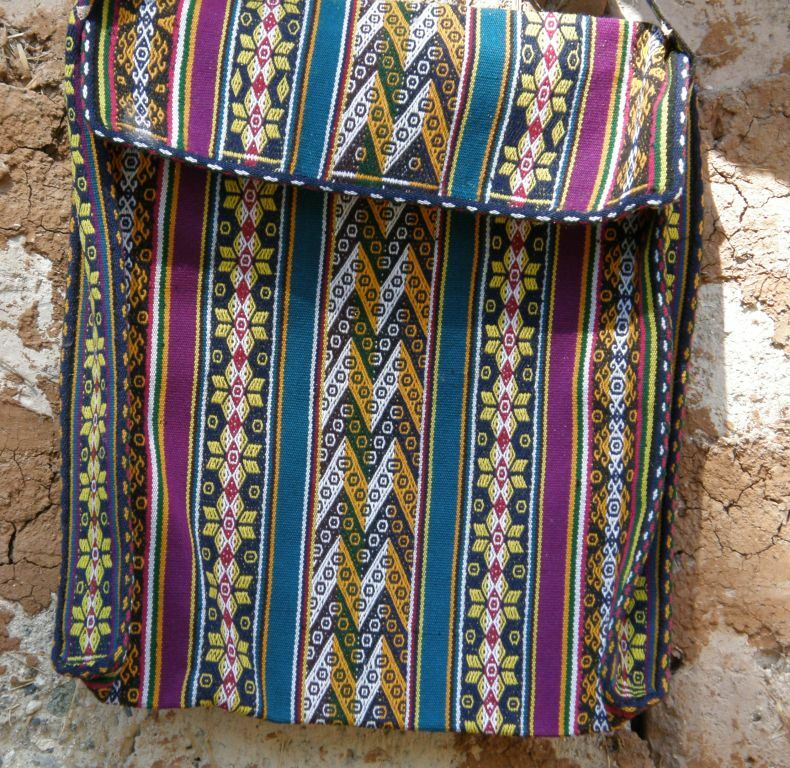 And I added some more eyes in the form of a ñawi awapa to the perimeter of the bag and braided a zip pull. And, as the Tour de Fleece is in full swing over on Ravelry (this is a spinning event run in conjunction with the Tour de France cycle race), I pulled out my handspun alpaca pouch with its spiraly eye-like Tarahumara design (now everything looks like eyes to me!) to remind myself that yes, I can and do spin and weave with my yarn and yes, I should contribute something to the Backstrap Weaving group’s Tour de Fleece team. So far only Janet and Jennifer are doing their bit. It was a toss-up between the bone button and the sweet wooden one which was made by a gentleman in the town where my weaving teacher Maxima lives. The wooden one is a bit on the bulky side for such a small pouch but boy, does it smell good! Then there is the wee black and orange bag-let also pictured above…another sample band that got turned into a pouch for guitar picks. My guitar-playing friend spotted it and came up with that idea. So, a snap closure, braid, tassels and ring was added and off that goes to its new owner. If you are wondering about the raw edge (I made three selvedges), I had enough band to turn to the inside and all the way to the bottom of the bag. 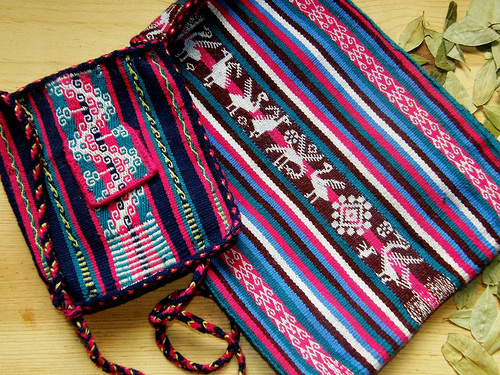 The pebble weave band at left, pictured next to a dime, is made from sewing thread and features stars that were inspired by Bolivian lowland weavings placed within a highland design. Poking around among my books is what unearthed the one on the textiles of Tinkipaya which has become a distraction from the other projects on which I have been working…a delightful distraction, I might add. I also came across some other forgotten gems squeezed in between the larger volumes. 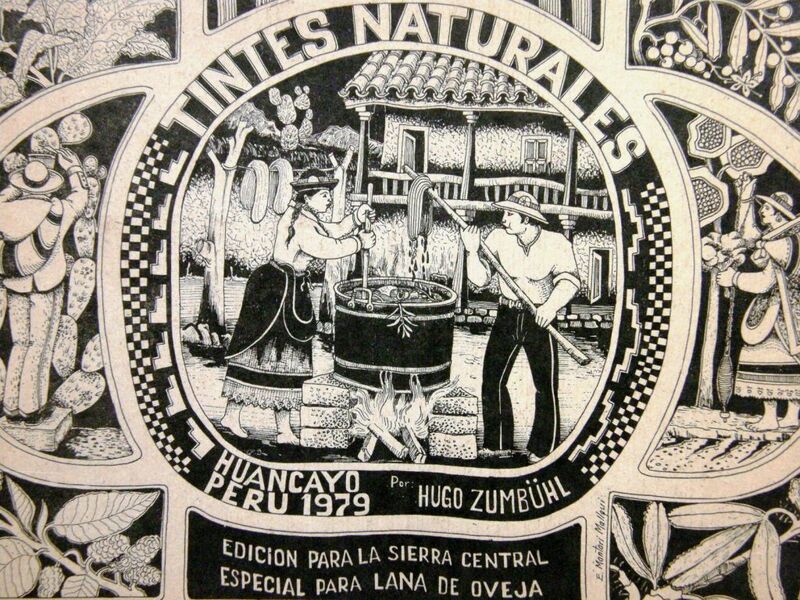 This is a book on natural dyes that I bought in Huancayo, Peru back in 1996. It is very simply made with very much a hand- made look about it and is full of plant and mordant samples in little plastic packages and dyed wool. The processes are explained with charming drawings making almost unnecessary the ability understand Spanish or even read for that matter. It’s a treasure. The style of drawings reminds me very much of the style of designs that you find etched on the gourds which are also sold in towns around Huancayo…. I bought the gourd, pictured below with its scenes of tropical lowland Peru, in a store in Quito, Ecuador and although I know it is from Peru, I can’t be sure that it is from the towns of Cochas Grande and Cochas Chico near Huancayo which are famous for this particular handcraft. But, in any case, I would like to show you the amazing complexity of the designs etched into its surface. I think every time I pick this up I see something new in it. Today I noticed the thick snake winding its way among the tree limbs for the first time. But, back to the book…Here is part of one page with plant samples, dyed wool samples, the local names for the plants and a glimpse of the instructional drawings. 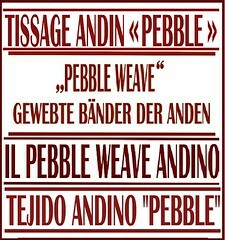 The first book on the left is what I consider a gem of self publishing and was one of the books that most encouraged me to “just do it!”, that is, go ahead and self-publish my own book on the pebble weave structure that I learned in Huancayo. It describes the process of constructing and setting up the kind of backstrap loom used in northern Ecuador and it, too, is filled with hand drawings and even yarn samples. The differences in the way that warps are wound and looms are set up throughout the South American highlands can be very different…the way heddles are made, the number of crosses that are used, the number of stakes used in warping. These differences are what makes this whole thing so intriguing and interesting to me. It would be ridiculous to think that there is only one proper way to do things. 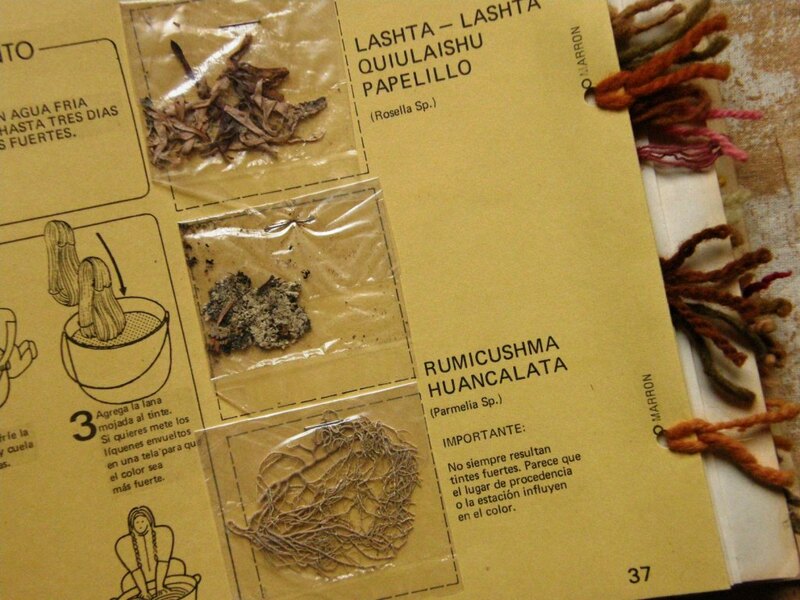 I was fortunate to be able to spend some time with a poncho weaver and his daughter in San Roque, near Otavalo, Ecuador and see the process described so beautifully in Redwood’s booklet, in action. In the picture above the weaver is preparing to make string heddles. Ms. Redwood, wherever you are, I would love to meet you! 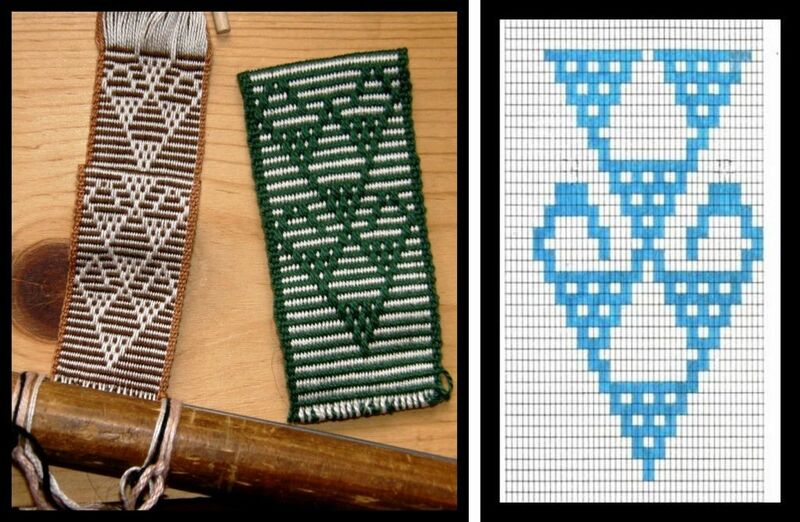 The book on the right is not about weaving but catalogs the designs on painted animal skins made by the Tehuelche people of southern Patagonia. This was given to me by a lady from one of the old British families who own many of the large sheep stations on the pampa of southern Argentina. She owned one of the skins described in the book and has donated it to a local museum. One thing is the thrill of looking at the books, another is remembering how I acquired them. There is a a whole rush of memories associated with the visit to that farm on the pampa. Another wonderfully simple self-published book was given to me by an elderly gentleman in Huancayo who was simply thrilled by my interest in the textiles of his home. The pictures and diagrams are all hand-drawn, it has been written on a typewriter and the paper is grainy and rustic. 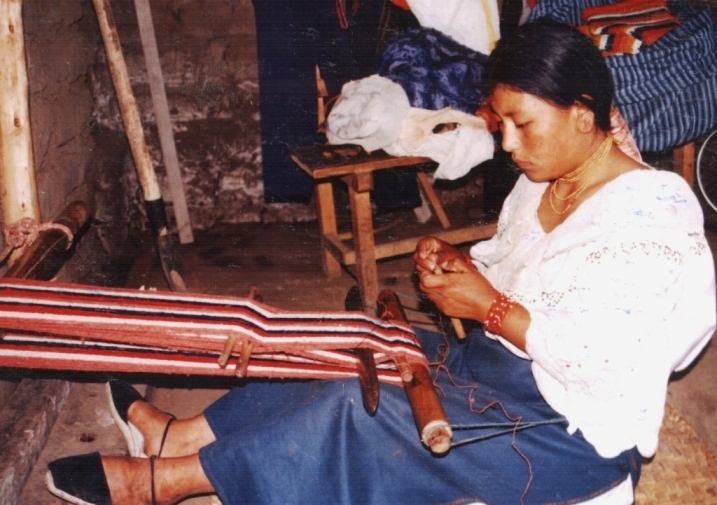 It includes meticulous step-by-step instructions on the construction of a floor loom and spinning wheel as well as an overview of the weaving tradition in San Pedro de Cajas. I remember effortlessly finding the book on the left in a store a couple of days after I arrived in Santa Cruz back in 1998. I thought that I must have arrived in a fiber and weaving paradise until I went to the market and had a hard time making people understand that I wanted to buy a spindle…no one knew what that was! 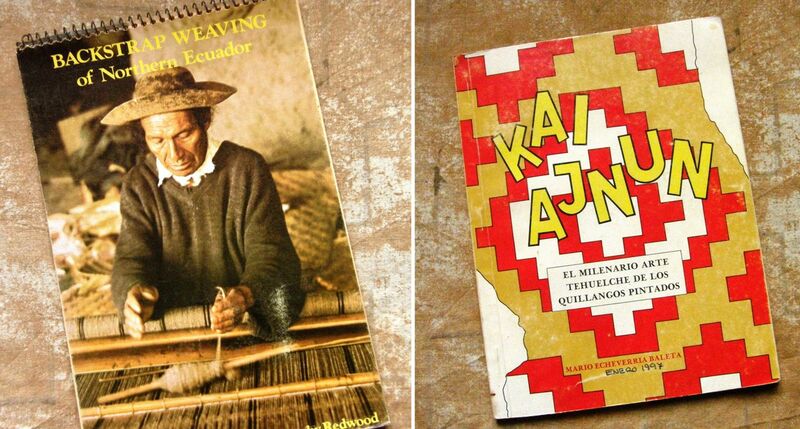 That is the one and only book I have found on the topic and it was only after a few years had passed that I met my first Guaraní weaver from Isoso here in the city. The other small book above, published in Argentina, is also available in English and can be bought online. 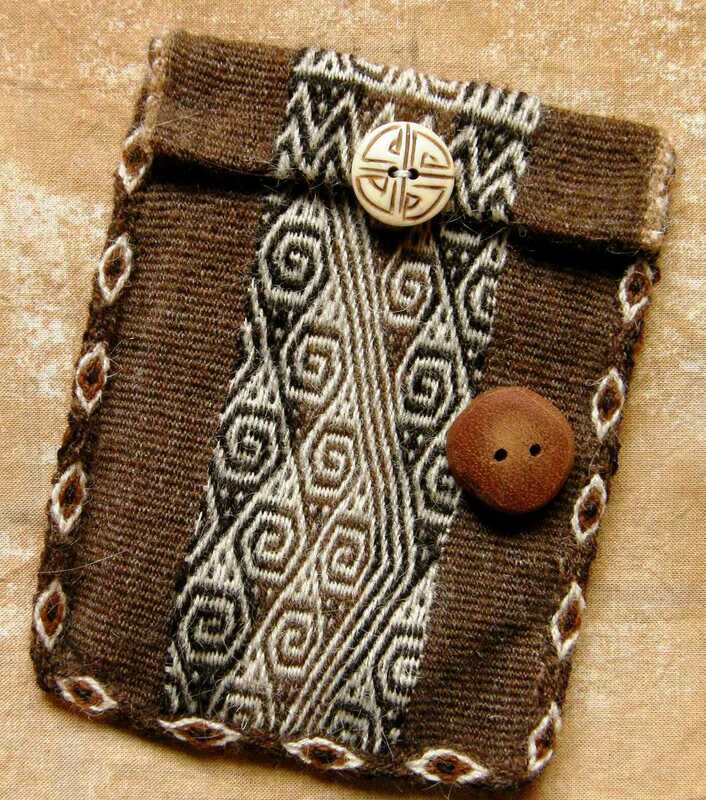 It is a lovely miniature book with lots of great pictures of Mapuche textiles and woven items used by the Argentinian gaucho, belts and ponchos from the north and south…many of which I have not seen in other publications. It also includes lithographs and paintings from the colonial period and I love those. 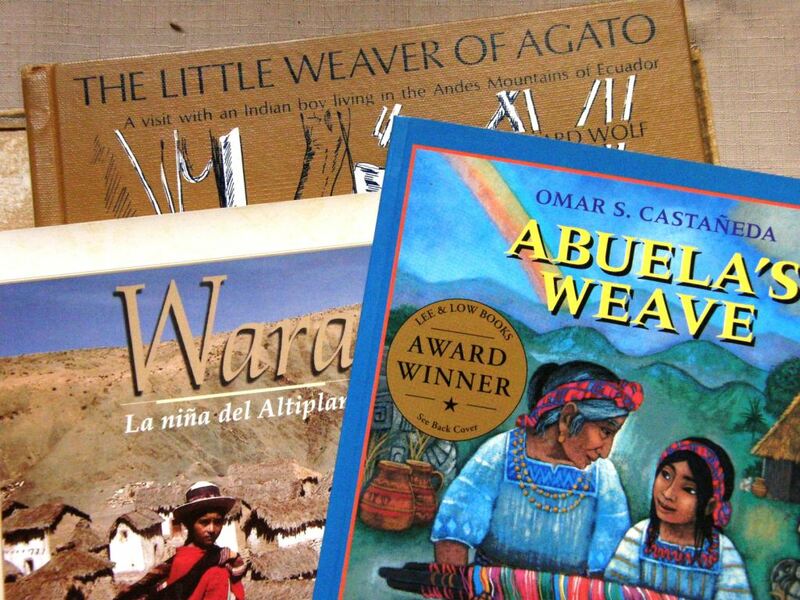 And last of all, at least for this blog post, I want to show you some story books about children that I have collected that describe their daily lives in communities of weavers in South and Central America. One is from Bolivia, one from Ecuador and the other, Guatemala. Dragging myself away from the book shelves, I will finish by showing you some work by Ravelry and other online weaving friends. 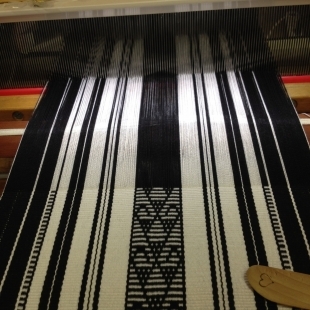 Karren was inspired by a Mexican rebozo to make her own black and white rebozo on her four-shaft floor loom in 8/2 tencel with a pattern in simple warp floats. 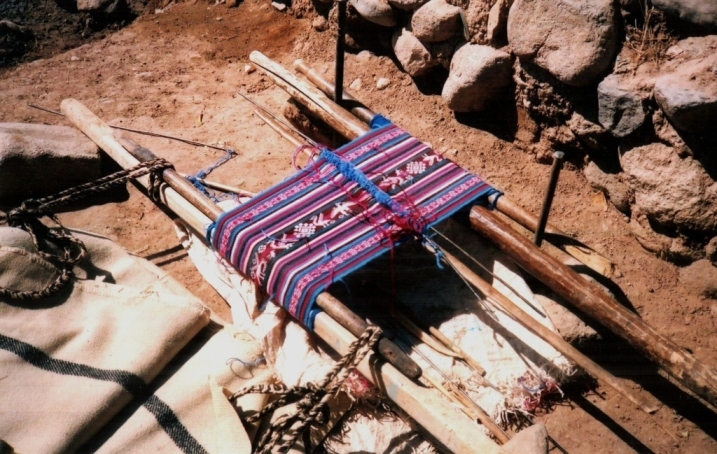 The rebozo that inspired her had varying widths of pink and white stripes along with fine horizontal bars that accompany the simple warp float technique. The fringe, like those on many of these rebozos, is a mass of intricately knotted figures. 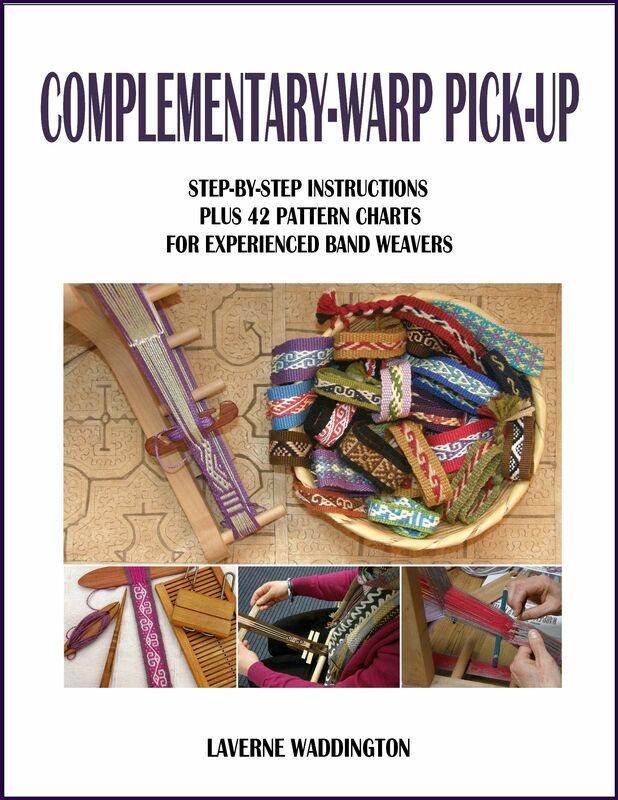 If you feel inspired to try something similar, the pattern chart for this particular design is here…and I am sure you know where to find the tutorial on my blog. It is hard to believe it’s warp-faced with that beautiful drape. 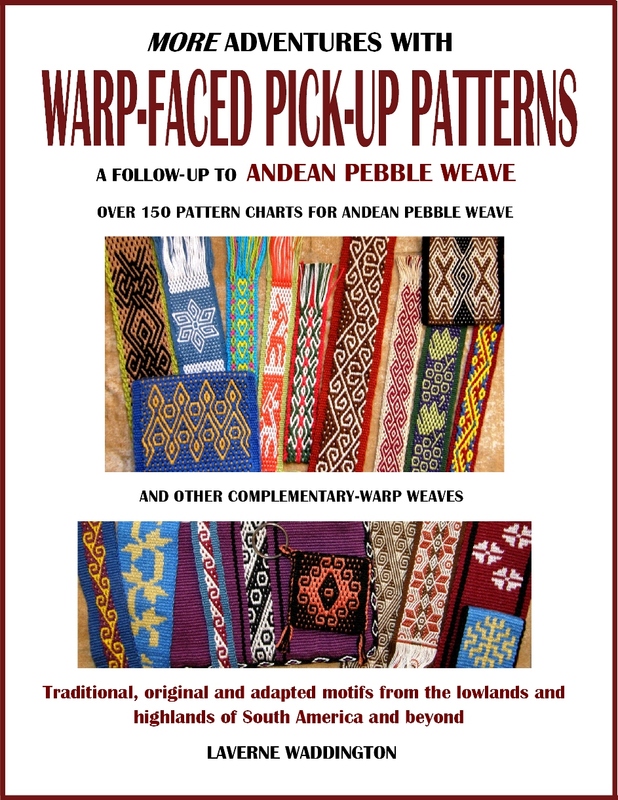 Karren’s project has inspired and encouraged me to use my tencel for warp-faced weaving. 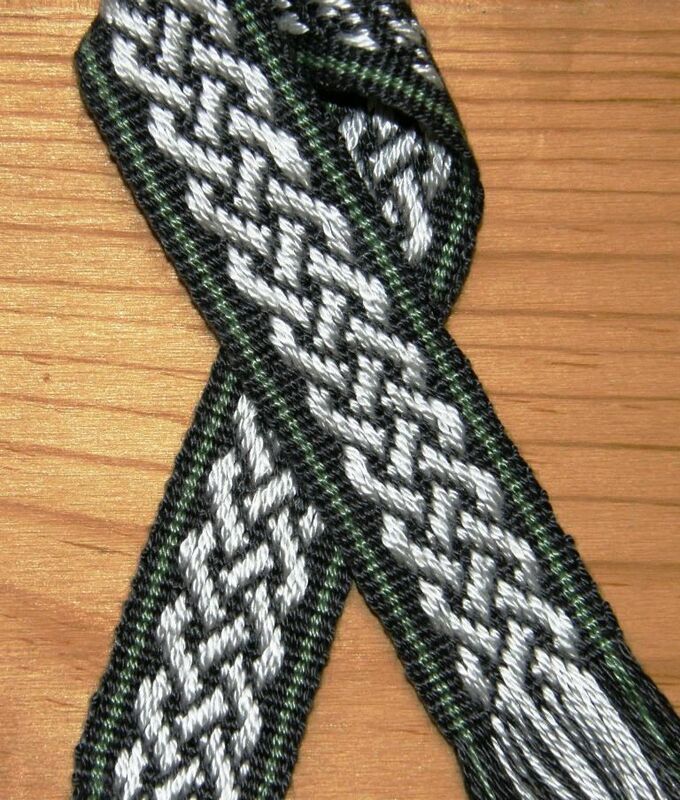 I have not been very brave and have only made a small supplementary-warp band with a celtic knot design using my tencel so far. Jane, who has recently returned from a trip to Peru where she studied weaving at the CTTC in Cusco, showed us the band that she is weaving at home. It was warped for her by her weaving teacher using the wonderful handspun and naturally dyed wool yarn of Chinchero while she watched the process and she made the string heddles herself when she got home. She is using the two swords to create a temporary picking cross which will enable her to pick up the threads for the complementary-warp patterns. 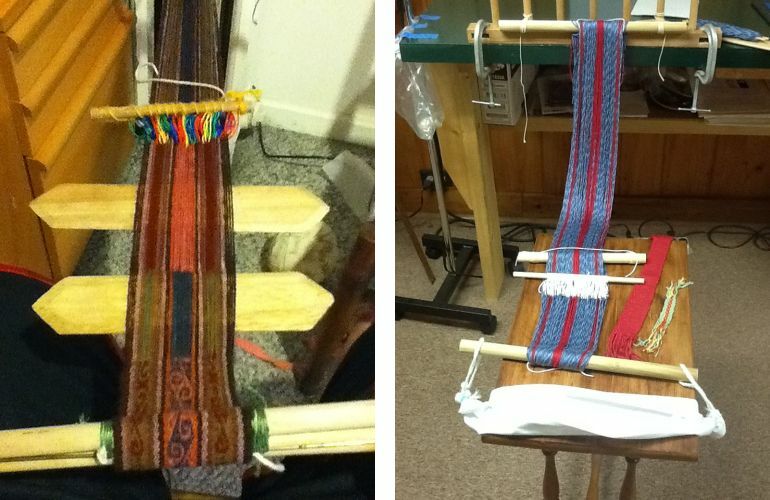 On the right, Isabel sent me a picture of her warp set up to make a backstrap following the instructions in my article on WeaveZine. On the table you might be able to make out her first small pebble weave sample which she made using my book. So, I am off now to get my favorite spindle and make a plan for spinning this weekend and put the books that I photographed back on the shelf while trying not to get sucked back into to book browsing land….I have way too many other things that need doing! 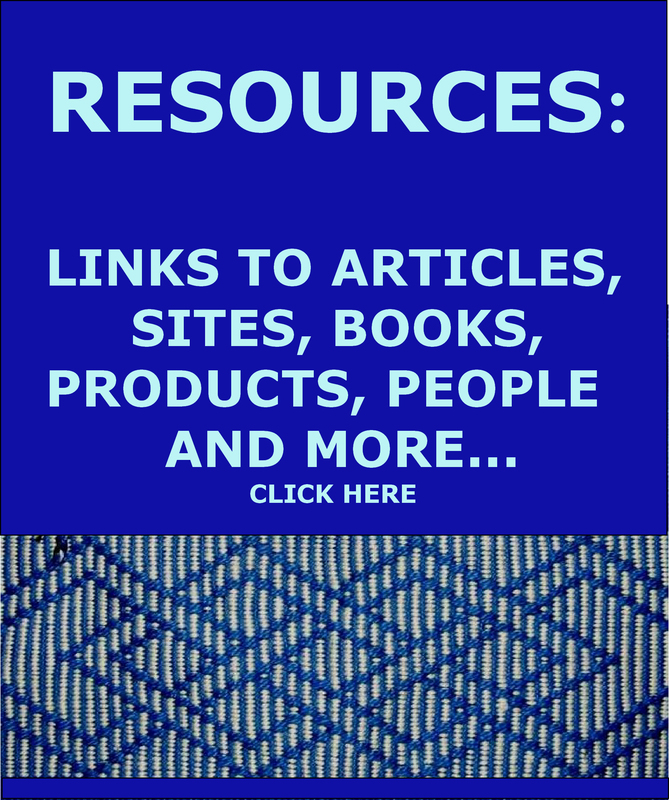 « Backstrap Weaving – Tools, Trinkets,Tinkipaya and Treasures from the Lowlands. Laverne, I just love the tinkipaya and nawiawapa patterns, the small eyes and the spirals and also the bright colors. 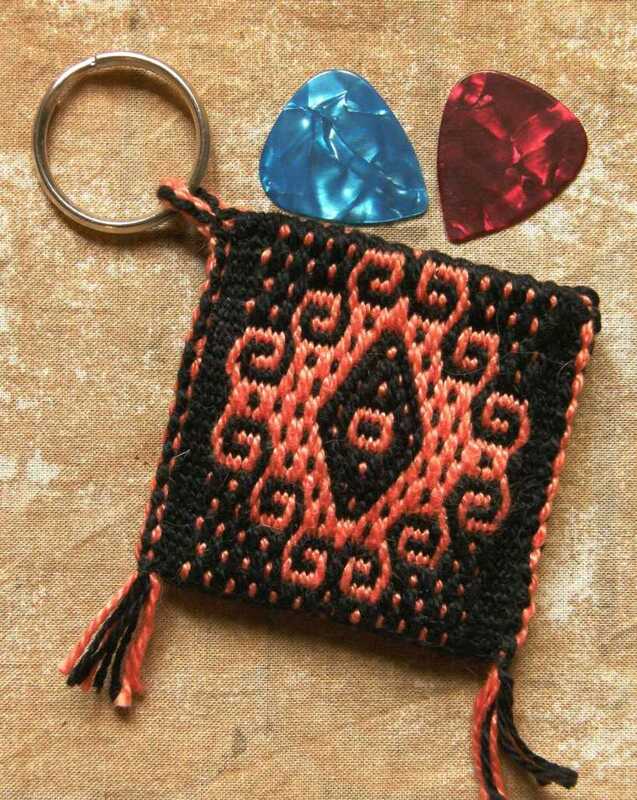 Perhaps I soon can manage to make a weave broad enough for a small bag, something like the one for guitarpicks would be a lovely present for the guitarplayers in my family, it is a wonderful idea for a small and beautiful thing. Your knotwork band in tensel looks a bit like silver, reminding me of a viscose yarn I tried for a viking age braid pattern some years ago. Even linen in its natural color can look a bit like silver in contrast to black (or any other dark color I presume). Have a nice spinning day! Hi Camilla, you are right, that white tencel does come up looking like silver…it’s really just the picture. Yarn with a lot of sheen is hard to photograph well. I hope you do advance to wider bands. I have enjoyed seeing you narrow ones and your idea for the hair band is great. I will show that picture next week. (see my blog cberl.skyrock.com) to weaving. By profession I am an American composer but the patterns and colors resonate with my music. i live in the country in Italy during the summer and in the winter teach at my New York Piano School in Casablanca. I wonder if you could direct me to places in Morocco where I could develop my knowledge of weaving. Hi Christine, I wish I could help but I have never been to Morocco and know almost nothing about the weaving there. You have such an interesting life! I took a look at your embroideries….they are really lovely. If you do get involved on weaving in Morocco, I hope you will write and let us all know about it. I certainly will, thank you for your response.